1 SOUTH DAKOTA BOARD OF REGENTS Committee on Academic and Student Affairs AGENDA ITEM: III A (7) DATE: June 10-11, 2015 ****************************************************************************** SUBJECT: New Program: USD Minor in Sport Marketing & Media The University of South Dakota (USD) requests authorization to offer a baccalaureate minor in Sport Marketing & Media. USD has a concurrent proposal for a major in the field. The minor will benefit students interested in the growing popularity of sport and recent changes in how sports are consumed, including social media and live online streaming, as well as growth in sport-related professional opportunities in South Dakota. The Bureau of Labor Statistics projects the overall employment of advertising, promotions, marketing, and public relations specialists to grow 12 percent from 2012 to 2022 with specialized employment within the sport and leisure industry representing a substantial portion of this growth. USD expects to graduate 16 students per year with the minor after full implementation. The proposed curriculum requires the addition of three new courses (all of which are also part of the proposed new major in the same field) and consists of 18 credit hours. USD is not requesting new resources. 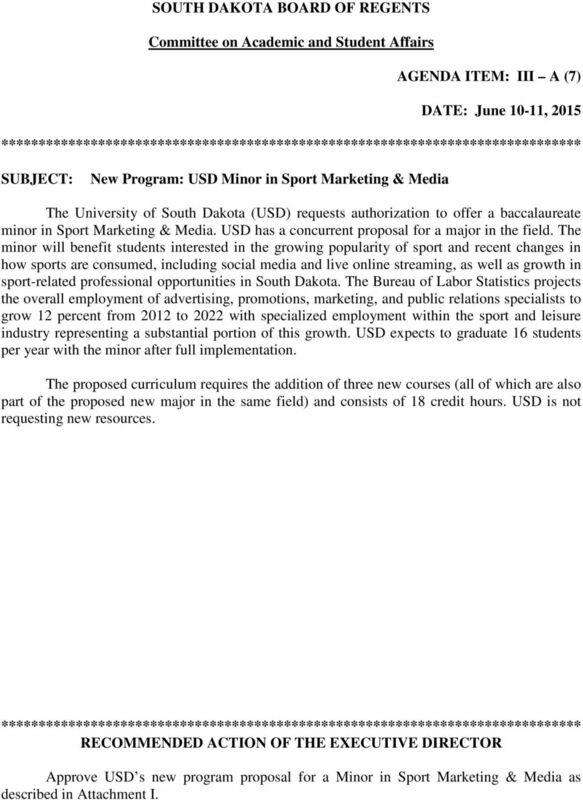 ****************************************************************************** RECOMMENDED ACTION OF THE EXECUTIVE DIRECTOR Approve USD s new program proposal for a Minor in Sport Marketing & Media as described in Attachment I. 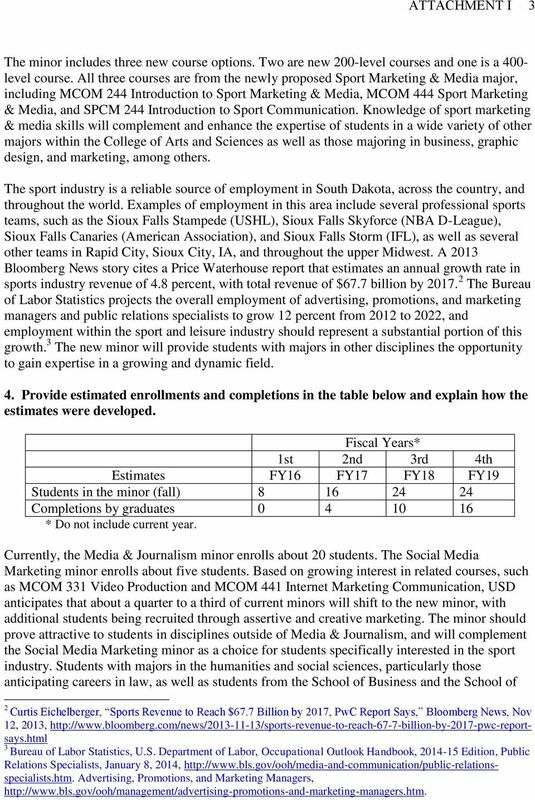 2 ATTACHMENT I 2 South Dakota Board of Regents New Baccalaureate Degree Minor University: University of South Dakota Title of Proposed Minor: Sport Marketing & Media Degree(s) in which minor may be earned: B.A., B.S., B.L.S., B.B.A., B.F.A. 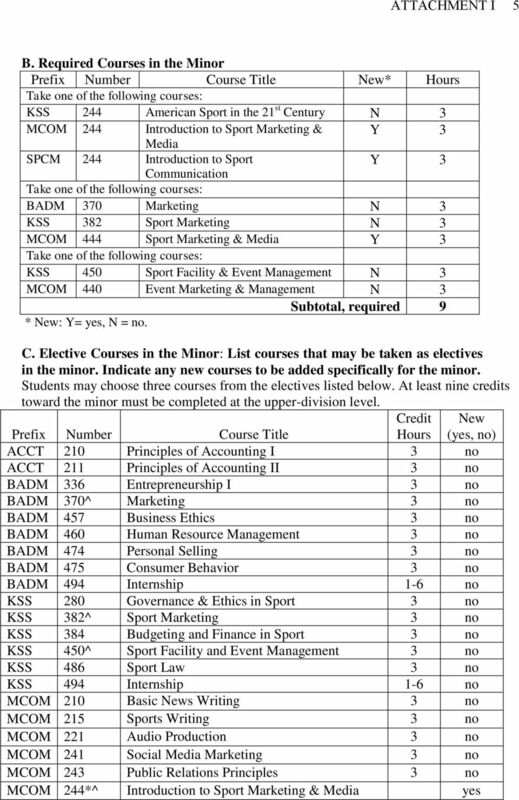 Existing related majors or minors: B.A./B.S. 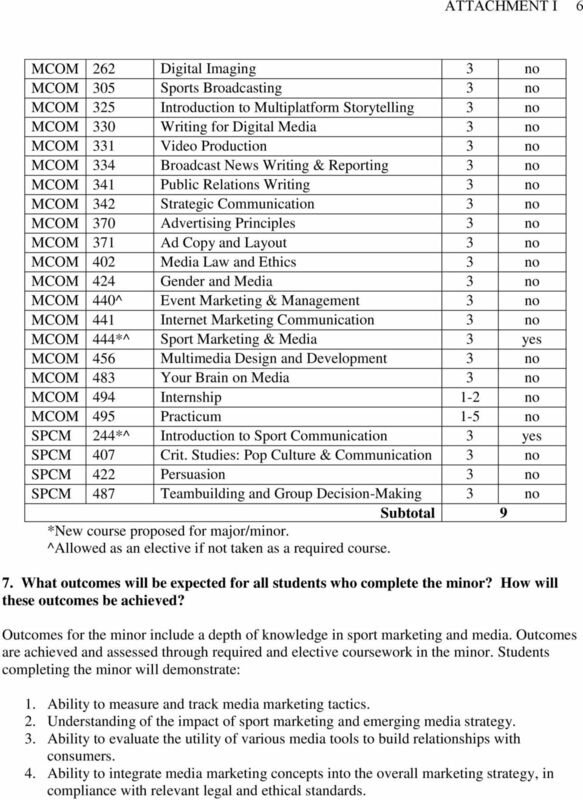 in Sport Marketing & Media 1 ; B.A./B.S. in Media & Journalism Major, Media & Journalism Minor Proposed Implementation (term): Fall 2015 Proposed CIP Code: University Approval To the Board and the Executive Director: I certify that I have read this proposal, that I believe it to be accurate, and that it has been evaluated and approved as provided by university policy. President of the University After approval by the President, a signed copy of the proposal should be transmitted to the Executive Director. Only after Executive Director review should the proposal be posted on the university web site and the Board staff and the other universities notified of the URL. Date 1. Do you have a major in this area? X 1 Yes No 2. If you do not have a major in this area, explain how the proposed minor relates to your mission. N/A James W. Abbott April 28, How will the proposed minor benefit students? The explosive growth in popularity of sport, fueled by the rise of social media, televised coverage and online streaming of sporting events, and extensive marketing, has contributed not only to a high level of interest in sport among college-age adults, but also to a growing awareness of career opportunities in related fields. Sport Marketing & Media is an increasingly prominent academic field nationally. The field is driven by digital media marketing skills and the need to understand how they are used to establish and promote individual and organizational goals, attract audiences, and connect with potential consumers. The minor will address the many issues surrounding this field and provide a guide to creating, measuring, tracking, and employing sport marketing and media strategies, and tactics to gain a competitive edge. 1 Proposal for the major curre ntly under review. 6 ATTACHMENT I 6 MCOM 262 Digital Imaging 3 no MCOM 305 Sports Broadcasting 3 no MCOM 325 Introduction to Multiplatform Storytelling 3 no MCOM 330 Writing for Digital Media 3 no MCOM 331 Video Production 3 no MCOM 334 Broadcast News Writing & Reporting 3 no MCOM 341 Public Relations Writing 3 no MCOM 342 Strategic Communication 3 no MCOM 370 Advertising Principles 3 no MCOM 371 Ad Copy and Layout 3 no MCOM 402 Media Law and Ethics 3 no MCOM 424 Gender and Media 3 no MCOM 440^ Event Marketing & Management 3 no MCOM 441 Internet Marketing Communication 3 no MCOM 444*^ Sport Marketing & Media 3 yes MCOM 456 Multimedia Design and Development 3 no MCOM 483 Your Brain on Media 3 no MCOM 494 Internship 1-2 no MCOM 495 Practicum 1-5 no SPCM 244*^ Introduction to Sport Communication 3 yes SPCM 407 Crit. Studies: Pop Culture & Communication 3 no SPCM 422 Persuasion 3 no SPCM 487 Teambuilding and Group Decision-Making 3 no Subtotal 9 *New course proposed for major/minor. ^Allowed as an elective if not taken as a required course. 7. What outcomes will be expected for all students who complete the minor? How will these outcomes be achieved? 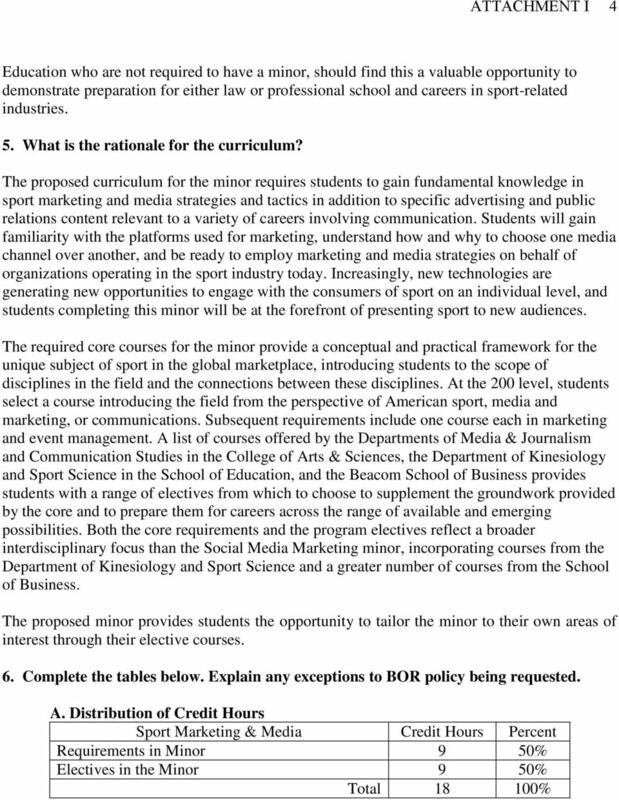 Outcomes for the minor include a depth of knowledge in sport marketing and media. Outcomes are achieved and assessed through required and elective coursework in the minor. Students completing the minor will demonstrate: 1. Ability to measure and track media marketing tactics. 2. Understanding of the impact of sport marketing and emerging media strategy. 3. Ability to evaluate the utility of various media tools to build relationships with consumers. 4. Ability to integrate media marketing concepts into the overall marketing strategy, in compliance with relevant legal and ethical standards. 7 ATTACHMENT I 7 8. What instructional technologies will be used to teach courses in the minor? 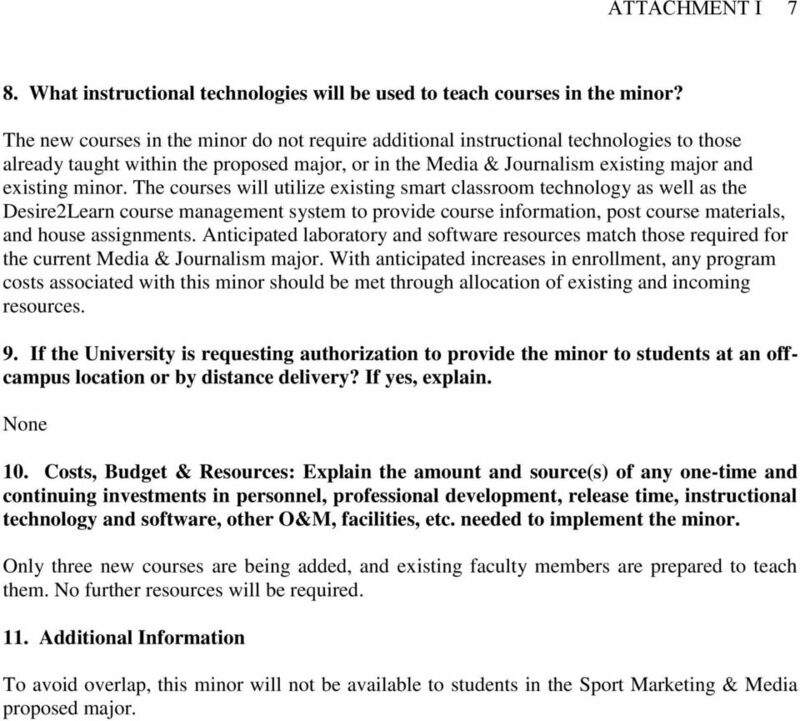 The new courses in the minor do not require additional instructional technologies to those already taught within the proposed major, or in the Media & Journalism existing major and existing minor. The courses will utilize existing smart classroom technology as well as the Desire2Learn course management system to provide course information, post course materials, and house assignments. Anticipated laboratory and software resources match those required for the current Media & Journalism major. With anticipated increases in enrollment, any program costs associated with this minor should be met through allocation of existing and incoming resources. 9. If the University is requesting authorization to provide the minor to students at an offcampus location or by distance delivery? If yes, explain. None 10. Costs, Budget & Resources: Explain the amount and source(s) of any one-time and continuing investments in personnel, professional development, release time, instructional technology and software, other O&M, facilities, etc. needed to implement the minor. Only three new courses are being added, and existing faculty members are prepared to teach them. No further resources will be required. 11. 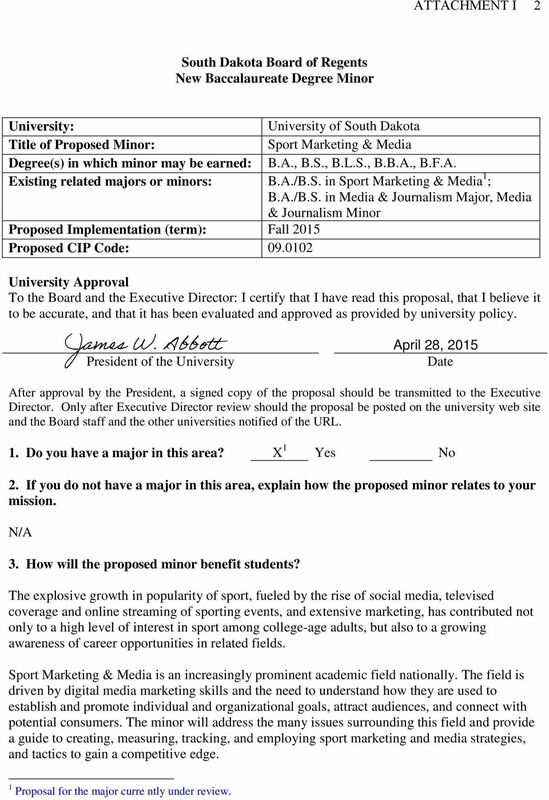 Additional Information To avoid overlap, this minor will not be available to students in the Sport Marketing & Media proposed major. South Dakota Board of Regents New Undergraduate Degree Program Note: Use this form to propose a new undergraduate degree program. An undergraduate degree program includes a new major, a new degree or both. SOUTH DAKOTA BOARD OF REGENT Full Board AGENDA ITEM: 14 A DATE: December 12-13, 2012 ****************************************************************************** SUBJECT: New Site Request: SDSU Ph.D.
4. DEPARTMENT OF ADVERTISING, PUBLIC RELATIONS AND MEDIA DESIGN (APRD) Mission Statement The strategic communication problems that organizations and society face today are more complex than ever before.